Healthy delicious post workout smoothie will fill you up after your sport routine and help you boost your metabolism. January brings a lot of people in to the sport clubs and i was not an exception. Working hard on a treadmill and free weights area, taking group classes and sweating sweating sweating… that is all amazing but how about a post workout treat? 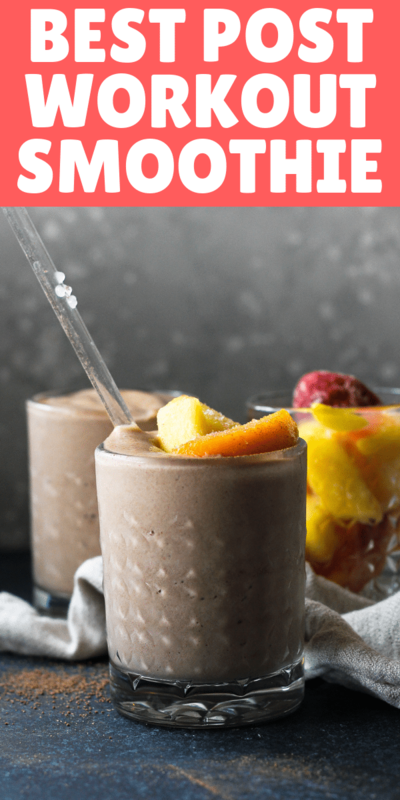 Not heavy, perfectly balanced with sweetness- this post workout smoothie is my favorite way to recover after hard work in the gym! The smoothie is calling for different kinds of fruits. You can buy them already frozen or freeze yourself (here is some tips on freezing your own fruits). I love the stone fruits paired with the cocoa. Yum! Absolutely love this! I always find it tough to fill that hunger after the gym and this will be a great start! Lovely recipe. Knowing I get to indulge on this delicious smoothie after a hard workout makes it even more worthwhile. I love the addition of cocoa to this with the fruits. This looks delicious. I’m always hungry after my workout. Will have to pin for my next day at the gym. 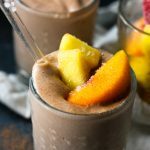 I’m a fitness fiend, and I’m always happy to find a new post workout smoothie! I love the combination of fruit and chocolate in this one. BTW, gorgeous photos! Now that is what a smoothie is far. A delicious nutritious treat after a hard workout to replenish the nutrients the body lost. And to keep energy up it’s best to do it soon afterward. Your smoothie would sure get me motivated to finish and get to it. Looks so delicious! And love all of the fruit on top. 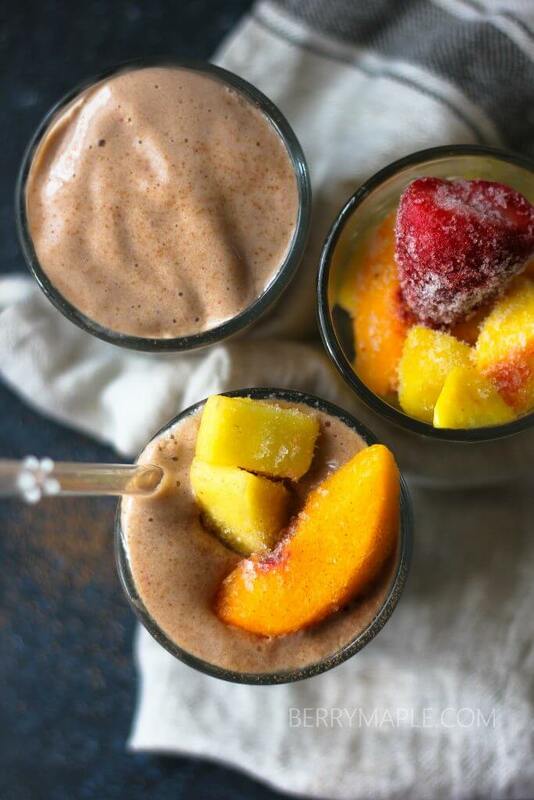 Smoothies are the best! That sounds delicious. So fruity! Sometimes, I wish I could just write, “Yum” and that’s it. Why? Because when something looks delicious beyond words, I don’t want to waste my time writing or talking. I just want to run to the store for the ingredients and whip me up some of your delicious post workout smoothie!! Your photos are beautiful! I can just imagine how the smoothie would taste, just by looking at them. Elaine, thank you so much for such kind words! This looks so good, and I love fruit paired with chocolate. I love that you are using raw cacao powder, too. My workout buddy has soy allergies, do you think this would work as well, and taste as delicious if we used either almond, coconut, or hemp milk? 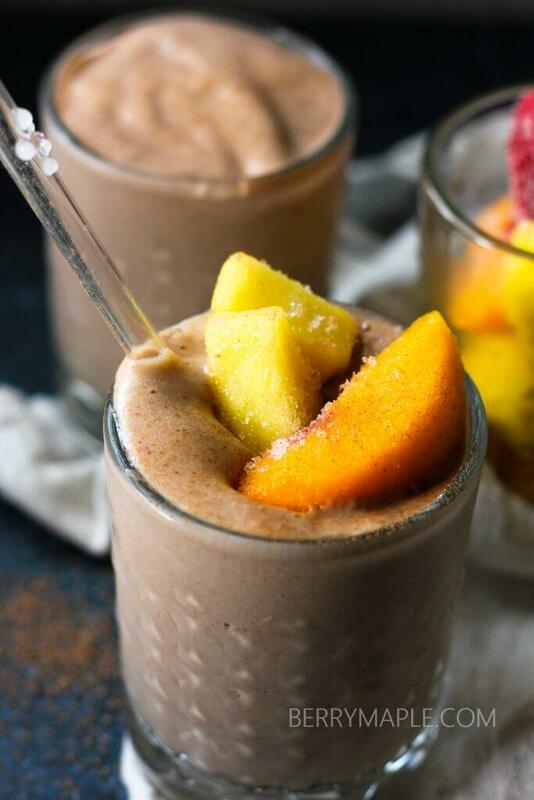 I’ve never paired stone fruit with chocolate in a smoothie before. I’m officially intrigued! I haven’t had much time to go to the gym lately. Does chasing after a toddler all day count? I’m going to have to try this as a toddler nap time afternoon pick-me-up! That frozen fruit on top has me seriously swooning over here!! 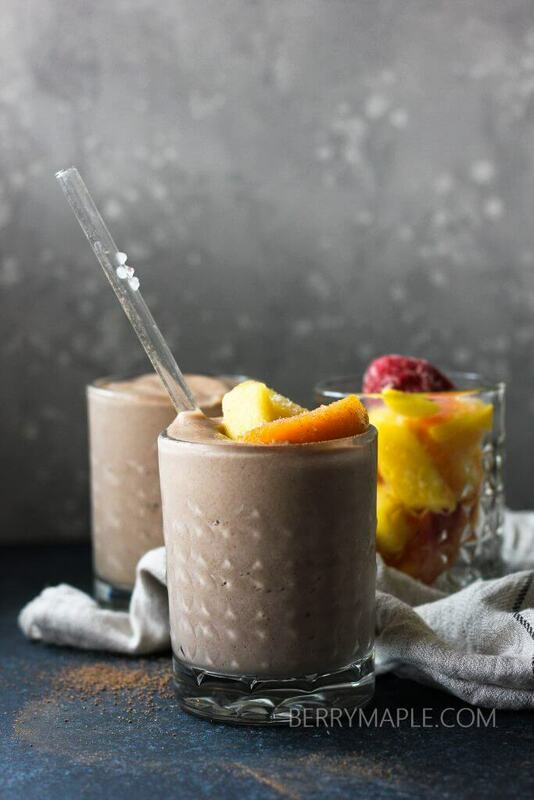 This looks like the perfect post-workout treat!